Sears Canada is having a great weekend sale right now! You can save on a wide variety of items. 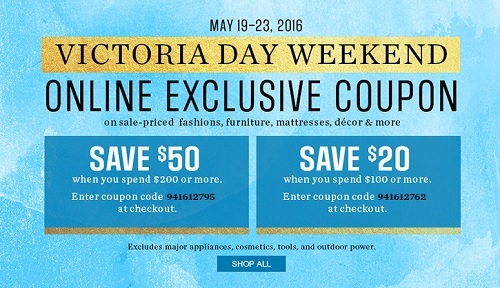 Save $50 off when you spend $200 or more with online promo code 941612795. Or, save $20 off when you spend $100 or more with online promo code 941612762. To receive te offer enter the online promo code at checkout. Offer expires on Monday, May 23, 2016. Official source of the information is Sears Canada. For more details visit your nearest Canadian store location.